You recently added a new type of advertising on your site which looks like a slightly different form of hyperlink. Now, normally this wouldn't be a problem, I am always in favor of keeping content free though recouping hosting costs with advertising , but this new form not only severely impacts Opera's keyboard navigation, but somehow manages to reformat the whole page's text if Opera's zoom function is in use and one of the links is highlighted (which is unavoidable with keyboard navigation), making it unreadable. Can I turn it off. Please? 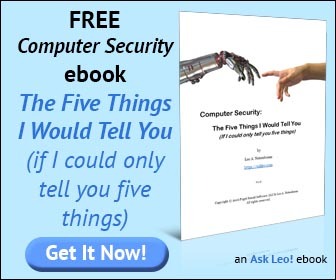 As you point out, Ask Leo! is a completely free service, and primarily advertiser supported. The neat thing about the advertising programs that Ask Leo! uses, is that they are "contextual" - meaning they relate to the content being presented. Even though I have no control over which ads are displayed, quite often those ads are part of the very solution that readers are looking for. But I definitely don't want ads to get in the way of your ability to even view Ask Leo! pages, so at the risk of decreasing the advertising income a little, I'll show you how you can turn it off. If you can't disable scripting on a site-by-site basis, then the next best thing is to modify your hosts file to prevent access to the advertiser's site. I've talked about modifying the hosts as a way to fake DNS when you're testing a new website, but it's also a common technique for blocking unwanted advertising. to the text file c:\windows\system32\drivers\etc\hosts - or the same file elsewhere if your Windows installation is in a directory other than C:\windows. In any case, the file should already exist. Depending on how aggressively your browser or your system caches files, you *may* need to exit and restart your browser, or even reboot to flush appropriate caches before the ads disappear. Hope that helps. Even if you can't see my ads, I'm glad you find Ask Leo! valuable enough to want to take these steps.